On a vibrant pink base colour, the Romantique collection will make you feel pretty in pink! This design contains cherries, birds, roses and the classic Decodelire characters. 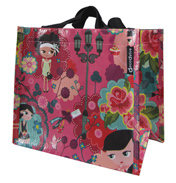 This cute design comes in many styles and variations, from a generously sized make-up bag to a handy document bag. With black straps and zips to complement the vivid pink base colour.